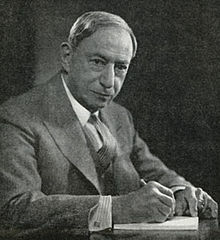 Hugo Gernsback was the working, and perhaps eventually legal, name of Luxembourg-born US inventor, writer, editor and publisher Hugo Gernsbacher (1884-1967), who emigrated to America in 1904 to market his various minor inventions. A successful catalogue of radio parts led to a focus on publishing magazines, mostly dealing with practical science or sf, though his most popular magazine may have been the mildly scandalous Sexology. Gernsback made important contributions to the growth and development of modern sf as a writer, editor, and critic. Gernsback’s first and best-known novel is Ralph 124C 41+: A Romance of the Year 2660. The story of a brilliant inventor who battles two villains on Earth and in space to win his true love Alice, the novel merits attention because of the ways Gernsback uneasily blended several generic models—melodrama, the travel tale, Utopia, even touches of Gothic and Satire—in an effort to achieve a workable vehicle for a story emphasizing scientific facts and predictions. In this way, the novel foreshadows and makes explicit many of the generic tensions that permeate later sf. A second novel, the episodic The Scientific Adventures of Baron Münchausen, which never appeared in book form in his lifetime, takes its title character from World War One in Europe to the Moon and Mars; less interestingly and less satisfyingly, it moves from pure Satire to pure travelogue to pure Utopia. A third novel, the posthumously published Ultimate World, combines Gernsback’s long fascination with gadgetry with a mildly involving story of mysterious aliens who visit Earth and genetically transform human children into super-beings. Gernsback’s short story “The Killing Flash” (November 1929 Wonder Stories) may qualify as the first work of Recursive SF: a final letter reveals that the preceding manuscript was only a story submitted to an sf magazine. As an editor, Gernsback regularly published sf stories, mostly by other writers, in his science magazines of the 1910s and 1920s. After publishing a special “Scientific Fiction” issue of Science and Invention in 1923, he then launched Amazing Stories in 1926, the first magazine unambiguously and exclusively devoted to sf, and the magazine that permanently made sf a publishing category. Gernsback deserves more recognition as a pioneering and influential sf critic. After first using the terms “scientific fiction” and Scientifiction, Gernsback coined “science fiction” in 1929, which has survived as the genre’s identifying term despite various challenges. The stories and editorials in Gernsback’s magazines inspired many published letters from readers, leading to contacts between interested parties that established the community of sf fandom – and to promote the genre, Gernsback also launched the first major fan organization, the Science Fiction League, in 1934. The Hugo Awards were named in his honor, and Gernsback himself received a special Hugo in 1960 as “The Father of Magazine Science Fiction”. He was posthumously inducted into the Science Fiction Hall of Fame on its inauguration in 1996.